Grand Rapids has fully embraced the craft beer resurgence and proudly carries the title “Beer City U.S.A.” it earned through an impressive online campaign earlier this year. There is even an exhibit at the Grand Rapids Public Museum, Thank You, Beer! that celebrates the history of beer and specifically the beer tradition in Grand Rapids. 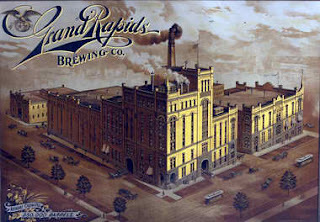 Prominent in the exhibit is a painting on the original Grand Rapids Brewing Co. that was once the largest brewery in the city and encompassed an entire city block, but it didn’t survive prohibition. The namesake and brewing reemerged in 1993 as the Grand Rapids Brewing Company opened as a brewpub and restaurant on 28th Street. It helped launch the beer culture in “Beer City U.S.A.”, but poor management and an inability to keep up with the innovative local beer scene caused GRBC to close its doors in 2011. Until last week when Grand Rapids Brewing Company opened its doors once again, under new ownership, having returned to downtown Grand Rapids under the ownership of the Sellers and StellaFly that also operate HopCat, Stella’s, and McFadden’s in the downtown Arena District. I thought about going down for the opening last week Wednesday, but decided against battling the crowds who lined up outside an hour before it open. I made my first visit on Saturday with BBQ Bob and Jop of The Grillin’ Guys and Cory and Shasta, owners of Old World Olive Press after we broadcast the morning show at their downtown location. We managed to pull together a pair of bistro tables by the door and beat the rush of families leaving the Van Andel Arena next door following the Grand Valley State University graduation. The hype and crowds are neither surprising nor unwarranted. GRBC had five house made brews on tap on Saturday: I enjoyed pints of the John Ball Brown, 09 Campau’s $90Pale, and Senator Lyon Stout – most brews are named after influential individuals from West Michigan. Other house made brews included a Mango Hefeweizen and the Silver Foam (“a new take on an old classic”). I must not have been the only one that enjoyed the Brown as brewer Nick Roelofs visited our table and shared that they were down to their last two kegs. Our group ordered a round of small plates to snack on and I must admit that we weren’t as impressed with the food as much as we were the beer. We ordered the kale chips (disappointing), Michigan Cheddar Cheese Curds (OK), poutine (a mess), Brewer’s Chips N’ Dip (I enjoyed it the most of the group), and the in-house Hand-Cranked Duck Sausage (good), and Sweet & Spicy Italian Sausage (excellent, best thing we ordered). It seemed that they are being a little over ambitious with the menu with creative small plates instead of focusing on offering excellent simple bar food which would seem to be a better fit for the location and vibe. I give them credit for aiming high, but that means that you're likely to have some swings and misses, especially early on. It must be noted that GRBC is the first certified all-organic brewery in the Mid-West. It is a great marketing item and I know that there are a lot of pro-organic people out there, but I’m just indifferent about it. Just make good food and beer. I was really impressed with the layout and décor. High ceilings, large windows along Fulton and Ionia Streets and two separate bars make for an open and vibrant atmosphere. They also did an excellent job in repurposing materials that add a lot to the décor. Most of the tables were made with the original wood floors from the building that were pulled up to open the basement for the brewing equipment; likewise bricks from the original structure were used to build the back bar; an old barn wall was refurbished and re-purposed as an inside wall with the GRBC logo painted across it; and an old metal door repainting the logo above the back bar really stands out. We also had great service on our visit. We had a great server; the general manager stopped by our table as did brewer Nick Roelofs while the owner, Mark Sellars bought our group a round. Yes, it’s nice to visit breweries with radio hosts and others involved in the local food scene, but we definitely weren't the only one's there having a good time. I am look ahead to analysis your piece of writing Old is New in Downtown: The Grand Rapids Brewing Company Returns and study extra posts shortly. I can see that you are a specialist in this field! I am launching a website almost immediately and this information is extremely helpful for me. Appreciation for all your assist and wishing you all the achievement in your big business. Are Unions Relevant in the 21st Century?